Darjeeling: Thousands were auditioned and judged by celebrities over a period of four months and the wait for the rising stars of Darjeeling hills is finally over. 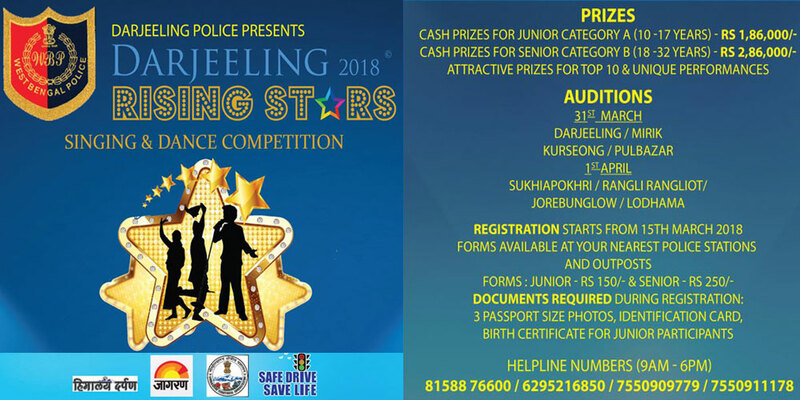 Darjeeling police has decided to hold the finals of the biggest talent hunt contest next week. "The finals of Darjeeling Rising Star will be held on July 28 and 29. Chowrasta has been selected as the venue of the finals," said a police source. The biggest talent hunt contest in Darjeeling included three categories, singing, dance and instrumental music. While 5000-odd participants had lined up for the singing and dance competitions, nearly 200 artists turned up for the instrumental round, which was organised through this month. The event, which carries a total prize of more than Rs 25 lakh is conducted by the police as part of their initiative to strengthen bonds with citizens. The contest, which started from April 1, had two categories - one for the age-group of 10-17 and the other for 18-31 years in singing and dance competitions. Instrumental was an open category. Ten finalists from each category have already been selected for the finals. The winners of the senior category will be taking home a cash award of Rs 2.5 lakh, while those winning the junior category will win Rs 1.5 lakh apart from gift vouchers. "A similar prize amount will be given to the winners of the instrumental competition ," said the source. The finals were initially scheduled to be held in mid-May. However, the event was postponed due to panchayat elections. In the meantime, the instrumental category was also introduced. Over 5000 participants had participated in the dance and singing competition, while nearly 200 participants had turned up for the instrumental category. The event is being supported by celebrities from India and Nepal. Adrian Pradhan, a household name in Nepali music and Kaviraj Ghataraj, a well-known choreographer from Nepal's film industry, judged the semi-finals rounds. Darjeeling Police plans to bring in celebrity artists for the finals. The contest also has the support of Bollywood big names like John Abraham, singer Mohit Chauhan, TV star Karanvir Bohra, hair stylist Aalim Hakim and Yogeshwor Amatya, a singer from Kathmandu, among several others. Thousands were auditioned and judged by celebrities over a period of four months and the wait for the rising stars of Darjeeling hills is finally over.